North Carolina CZT Jane Catherine is another perfect example of the generosity of the Zentangle® community. After we explored the idea of adding color to your Zentangle art, Jane Catherine offered to write this article for TanglePatterns sharing her experience and suggestions on the subject of lightfastness and color. And why it’s important to carefully consider the materials you use for color in your art. Even though I am a brand-new CZT from Seminar #18, I offered these notes to Linda of TanglePatterns.com (Thanks, Linda!) in case this information might help CZTs and others who love to add color to their Zentangle and ZIA pieces. I haven’t seen this issue discussed very much in the Zentangle community, and it could be quite relevant. I want to be clear that lightfastness is NOT an issue in the original Zentangle process taught by Rick, Maria and Molly, which is what we as CZTs want to teach everyone and continue as a practice ourselves. Genuine Zentangle materials are archival and lightfast: archival papers, Sakura Pigma Micron pens, and graphite shading. It’s only when you can’t resist coloring (like me!) that lightfastness can come into play. If you send a Zentangle — or an original Zentangle Inspired Art piece — to someone — a tile, a greeting card, whatever — they are likely to put it up on display on their mantel or somewhere. Maria mentioned in our CZT seminar that people do this all the time with the cards that she makes, and you’ve probably experienced this already also. Like I said, an original Zentangle tile will be lightfast, but as soon as you add colors, you’re into the realm of color pigments, inks, and dyes, some of which fade over time, especially when exposed to sunlight. Depending on what you’re doing with your artwork, this may or may not matter to you. If you’ve added color and then you give away or sell your work, you need to decide whether you care about lightfastness or not. If you’ve never had any teachers who talked about this, or if you’ve always used watercolors — for example — that are lightfast, you may not realize how quickly some kinds of color can fade in a regular house when exposed to sunlight and even artificial lighting. If you’re still reading, we’ll go from here into the media that seem to be most popular in the Zentangle and ZIA worlds: watercolor, colored pencils, and markers. I’m trying to control my obsessive-compulsive traits here, but it’s still long and maybe too detailed. I’ll try to sum it up again at the end. 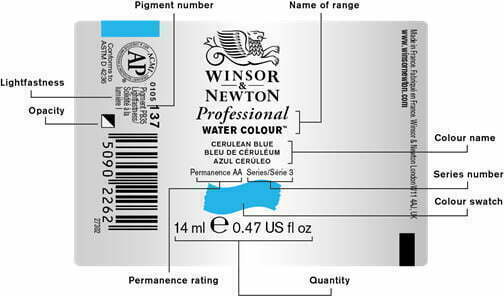 Image from “How to read the label on a Winsor & Newton colour”. Quoting: “Lightfastness: Is shown with an ASTM rating for the pigment. The ASTM abbreviation stands for the American Society for Testing and Materials. This organisation has set standards for the performance of art materials including a colour’s lightfastness. In this system I is the highest lightfastness available, though both ratings I and II are considered permanent for artists’ use.” Click image to visit W&N page. Artist quality watercolors are made from physical pigments plus the ingredients that put the pigment onto the paper and hold it there. Physical pigments come from things like iron and cobalt, actual physical “stuff.” Some of these physical pigments turned out to fade over time and exposure, and we call them “fugitive”. (That term cracks me up, having worked in the forensic world years ago.) There are actually famous paintings that changed significantly in hue over time, like the green of trees turning blue because the yellow pigment died out of the green and left the trees bluish. But if a high-end watercolor manufacturer has used one of these less permanent pigments, it will show up in the lightfastness rating on the tube. The watercolor community has long fought for watercolor works to be seen as “fine art” on a par with oil paintings on canvas, for example. It was pointed out that art works on paper can survive for centuries under the right conditions, while works on canvas can crack and degrade in various ways. Some watercolorists fought for respectability by emphasizing archival materials and lightfastness in the watercolors themselves. They tried to convince other watercolorists to help in this endeavor by abandoning fugitive colors. But a whole different perspective was maintained by traditionalists who loved some of the old-fashioned formulations, recommended them long after they were known to be fugitive, and thought the whole issue was for crazy obsessives (Hello!). Now you can choose for yourself according to the ratings on the tubes. If you can’t find the lightfastness rating easily on the product or on the manufacturer’s website, you can’t count on its longevity. Handprint.com is a great resource on watercolor pigments and papers. As the creator of the site reached his seventies, he slowed down on actively updating it, but what is already there is vast. He is totally over-the-line obsessive-compulsive — makes me look like a sloppy child — and will tell you everything about which pigments are lightfast, how watercolors are made, how to test them for yourself, how it is possible to measure color hues, how the human eye perceives color, and more. Beware — you will never be able to look at a simple color wheel the same way. Please don’t think that I am maligning any of the coloring mediums that are not lightfast. Many of them are not meant to be! We owe a lot of our contemporary coloring tools to the world of design and illustration, ranging from fashion design through manga and animation. In that world, the art that is distributed has been copied or printed or somehow reproduced. The original art work ends up on file somewhere. Maybe it’s stored in the darkness under archival conditions, maybe it’s lost, or maybe something in between, but the point is, nobody cares about whether the original is lightfast. I used lightfast materials compulsively until I finally realized that, 1.) My work was never going to end up in a museum anyway (LOL), and that, 2.) When I really liked an art piece, I usually gave away or sold prints rather than originals. The point here is that if a coloring tool is geared toward the design and illustration market, it may not be appropriate if you need your original art works to last, but it’s perfectly fine if you are using it to print up notecards or coasters or prints or whatever. In that case, you might want to make sure that the materials the printer uses are appropriate for your purpose. That’s beyond my scope, but if you’re actually getting high-end prints, like the giclée prints that Rick and Maria make available, the fine art printers understand all this stuff and can tell you about their materials and viewpoint. Even some home printer/copiers can use pigment-based inks. Some products sold as watercolors are not made of pigments at all, but various dyes that are not designed to be lightfast. These weren’t meant for the “fine art” market. I’m putting quotation marks around “fine art” because I don’t actually believe in many of the snobbish distinctions between crafts and fine arts and so on — I’m in favor of using whatever you like. You just need to know that when you go to buy something that is marketed as a watercolor, it might be made of dyes and stuff that isn’t archival. Again, depending on your purposes, this may or may not be bad news. For example, liquid watercolors like those that come in jars with eyedroppers are frequently dye-based, and you have to check carefully for lightfastness. The manufacturer will (or should) make this clear somewhere on the labels or at least on their website. You also need to be careful with watercolor pencils, which may or may not be lightfast. Some brands have the lightfastness rating printed right on the pencils, like the Albrecht Dürer line. Others are less careful. Some people don’t even trust the labels on the pencils and do their own testing. Colored pencils are extremely risky as to lightfastness. The highest quality DO have lightfastness ratings on them, and some manufacturers at the high end are putting an emphasis on lightfastness because there are more and more artists who make and sell gorgeous original art works using colored pencils. Lisa from Lachri Fine Art has several videos about this on her Youtube channel. She’s got the story on all things colored pencil! Some colored pencils have the lightfastness ratings right on the pencil itself, like the Polychromos line. (It’s made by the same people who make the Albrecht Durer watercolor pencils I mentioned, but they’re not the only option.) Other manufacturers have stated that nobody in their target markets cares about lightfastness, so they are not going to raise the price for a feature no one wants. Most markers, even artist quality markers, are not meant to be lightfast because they came out of the world of illustration and animation where it’s the prints that need to last. There are pigment-based lightfast markers, such as the Pitt Artist Brush Pens, which have the lightfastness ratings right on the pens. But much as I love the Pitt colors, I couldn’t get the blended watercolorish effects I wanted. I splurged on Copic Sketch Markers which blend beautifully and let me do all kinds of watercolorish things, but they are not meant to be lightfast. I love watercolors too, but I’m such a klutz that if I used watercolors while tangling in my big reading chair, there would be spills everywhere! Markers are more relaxing for me, and God knows I need tangling to be healing rather than frustrating and punctuated by little disasters! Using Copics means that my originals can’t go up on somebody’s wall for 100 years or last forever in the World Zentangle Museum. I am not familiar with the gazillion other lines of art markers out there, but the general rule is that you can’t count on lightfastness in the world of markers. They weren’t designed for “fine art” originals, but for designers and illustrators. The manufacturer of the markers you like will make it clear on their website if they have designed them to be lightfast. And be aware that other marker terms like “permanent” may or may not mean lightfast. If you love to color your originals and send them to people, you might want to try the Pitt Artist Pens and see if they work for you. If anybody knows of other archival, lightfast markers, maybe you could let us know. If you don’t need your originals to be lightfast, you don’t have to worry about this anyway. If you sell prints or reproductions, you might want to make sure they use lightfast pigment inks on archival paper. If you need your originals to be lightfast and you use colored pencils, you’ll have to be very selective. If you love markers (like I do), you might want to emphasize archival prints or copies, unless it’s okay with you and the recipient that the colors might not last if displayed on a wall in the house. Many thanks, Jane Catherine. It’s so helpful to have these technical considerations described for those who aren’t aware or just to be reminded of them, and I’m sure this will prompt further Google research for those interested in more details. If longevity is important to your art, then permanence and lightfastness must be taken into consideration when selecting your color tools. Once again, PLEASE PLEASE Share Share Share this page on all your favorite social media. Jane Catherine has earned it! Lightfastness information – “How to read the label on a tube of paint”, from painting.about.com. Thanks so much for the wealth of information! I hadn’t even thought of lightfastness before this. What a great post! Thank you so much for the wealth of information for those of us not “in the know” about the technical stuff. What a well written and informative tutorial! Thank you for sharing your knowledge and experience, Jane, and Linda for publishing it. I read and absorbed every word. Will I remember it? Maybe! Lol! Thank you so much for all of the time and work you’ve put into getting us this very important info. There was a time when all I did was tangle, but for some strange reason I’ve quit, which I don’t understand and really feel as though I’m missing out, being left behind, even sort of homesick? Back when I was so passionate about Zentangle, I wanted to add color but had no idea of how to go about it. Now I totally understand, ahem, lightfast, and am considering getting back to my long lost “friend.” Thank you, Jane Catherine, from the bottom of my heart! I hope you find your way to some kind of artful meditative practice! Good luck. This is a very helpful article. But could I just add that the term ‘permanent’ on colouring products does NOT mean light-fast. It just means you can’t remove it from surfaces and fabrics. This can be very confusing. Light-fast of course, means that it doesn’t fade when exposed to light. Joan–exactly right! Thanks for making that clear. The term “permanent” can indeed mean different things in different contexts from fabric dyes to watercolors to fountain pen inks. The terminology is not at all standardized. It gets complicated! Thank you to all who have left appreciative comments already. It is REALLY nice to know that these notes have reached you and meant something! Permanent markers… are not colorfast on paper surfaces, not sure about other surfaces. Seems like they should be, but they will fade over time unless sealed with something. I’ve used spray fixative, Diamond Glaze, Glossy Accents, Royal Coat with success for sealing the art, however… each will change the appearance of your surface somewhat, meaning may make it satin looking. I use Sharpie and Bic brand permanent markers, have for years. Also Micron Pigmas for tiny work. Haven’t experimented with lightfastness for the Pigmas though. Anyway, just my two cents. Thanks for letting us know what you’ve learned! Great article! About colored pencils: the Colored Pencil Society of America has done a lot of research on lightfastness. The ratings on the pencils are not entirely accurate, but you can get a report on the individual pencils (regularly updated) if you are a member of the society. Here’s the link: http://cpsa.org/cp-product-info/about-lightfastness. Good to know! Thanks. It’s great when you can find objective ratings somewhere! From what I can tell, colored pencil artists are turning out magnificent pieces and are currently fighting for respectability like watercolorists did. Have been looking into the Winsor & Newton Watercolor Markers: product info and also some online youtube reviews, and they sound like they are lightfast. I don’t own any of these, but perhaps Jane Catherine or someone else in the zentangle community has had some experience with these new markers and can share some insight. UPDATE: Please see below for my reply to Karen. Since my earlier reply to J, I couldn’t resist and sprang for these. Beautiful colors, and true watercolor. I wanted to give you a “wink” but couldn’t find the emoticons! What excellent information here – so helpful for those who like to colour their zentangles (which I have just started to do with cards etc.) I use water colours with a very fine brush, but pencils are so much more practical – thanks so much for sharing. Thank you, Jane Catherine, for sharing your research! I bookmarked this page for future refreshers. WOW — thank you Jane Catherine for the wonderful eye-opener!! I am fairly new to the Zentangle world. Thought at first it was just strictly a black and white art form (and of course grays for shading). But I guess as usual there are those who are curious to push the envelope further, and add colour to it. Your article was like starting to peel back the layers of an onion on this subject, depending on as you said, how important it is to you how long your pieces are to last. And I guess this may actually just scratch the surface of this whole area — that one could go further and further looking for more detail — removing more and more layers of the onion. Very interesting!! Thanks again!! And thanks to Linda for putting your tutorial on this site — a very important and colourful initiation for us all!! Thank you so much for the very helpful information! I love adding color to my zentangles. Right now I’m using Inktense pencils to color them — I’m wondering if you know anything about the lightfastness of them? I first lay down a light layer of fabric painting medium (to wet the area I want to paint), then I can paint, highlight and shade with the Inktense pencils. My understanding is that they turn to ink (and I think it’s a permenant ink), when touched with water. The blendability and softness is great. I’d like to know what you think! Thanks! It sounds like you are making some beautiful things! Unfortunately, I can’t tell you whether the Inktense pencils are lightfast or not. The manufacturer uses that ambiguous word “permanent” that we talked about in earlier comments, but they don’t seem to claim that they are specifically lightfast. You might have to contact the manufacturer if you want to be sure. It’s still a good idea to do your own tests for your own particular application. I am very new to Zentangle. Thank you for a very interesting article. A big thank you to the people who posted comments yesterday! I’m so glad you found this info to be useful! When you think about anything, or just about, things exposed to light will eventually loose its brilliance. It is definitely your choice in the medium you use to tangle. It’s also about enjoying your time when you tangle. Mindfulness. Got anglers Go! Thanks for helping “untangle” some of my confusion about color that I’ve found intimidating. Hi, I just started tangling, literally last night. When I found this website this is one of the first articles I went to. I had an art instructor in college, long ago, who discussed this. The best way to test is as Jane Catherine stated above with the following addition: before taping your paper that has the medium you’re testing on it, cover half of the image with a heavy paper that won’t let any light through. When you take it out of the window, you’ll really be able to tell how the sun has affected your medium. Regarding Sharpie “Permanent” markers, I know from personal experience (I use them for labeling) that the black markers can fade over time and take on a reddish hue. This looks like a really great website. I’m sure I’ll be using often. Thanks. Love the post. Do you know if WN has a lightfastness rating for their gouache colors? That is another good option for coloring tangles and ZIAs. It is also possible to use archival inkpads to create backgrounds prior to tangling, but I’m not certain how lightfast they would be. Best bet is to check the manufacturer’s website. As I recall, Ranger puts some pretty good info on their site. A couple of things people may want to consider for original pieces that are going to be displayed — UV protectant spray sealer or uv protectant glass for a framed piece. In case anyone is still wondering, back to Meldra’s question about Derwent Inktense pencils: I just found out Lachri Fine Art posted a youtube video just yesterday which covers the permanence and lightfastness issues and communicated directly with Derwent about the product. She is very positive about their “permanence” with regard to laying down layers of color over layers that are already dry, but not happy about the lack of lightfastness. She discusses this knowledgeably, IMHO. I purchased a set of colored pens today. (Prismacolor Premier Fine Line Marker). They are listed on the package as Lightfast. Seeing it, it was the first time I had given that aspect a thought! I came to the site tonight to look for a particular Tangle and saw this post, how timely. Thank you for all the information! Thank you, Jamie. Glad it’s useful! The only markers that seem to be truly lightfast (100 years) are pigment ink-based markers. Some companies imply theirs are lightfast but in reading through blogs I have learned they are not. If someone else knows of other pigment ink based markers, please share. Those are the only two I have discovered and actually used. Thanks for this. I have only one addition: I’ve been experimenting with the Winsor & Newton Water Colour Markers [sic], which are truly W&N watercolors. I have not gone into which pigments are used in which colors (which can affect the lightfastness, as you probably know), but in general these are true artist watercolors in marker form. Very juicy and colorful. I’ll be interested if you try them. Nice to see someone else on this quest! The PITTs do blend on the canvas because they dry slower. Sometimes their colors appear less bright than expected so I often go over them twice, but in a way to get the highlights where I want them. This works rather well actually. I am trying canvas coloring because I have never done it before. What I like is that it looks really interesting when done – and looks professional. Lightfast is important hanging them up in a room with lots of windows. I found an interesting website to buy pre-printed canvas “Adult” coloring. Check it out. I have found the people there to be very nice and helpful, and open to new suggestions and ideas. Does anyone know about the chameleon pens? They look like a lot of fun since each color graduates from light to the darkest shade. Curious to know if anyone has tried them and if you like them. According to Lisa Lachri, the Caran d’Ache Luminance colored pencils are lightfast–all of them, I believe. At around $4 a pop, they are also the most expensive pencil. But they are also open stock (at least at Blick) which is useful. You can try a few of them to see how you like them. I am very pleased with them but for the quality/price ratio, don’t think you can beat the Prismacolors, although not all of their colors are lightfast. For example, their light peach is rated as excellent while their orange is rated as poor. They do have a chart specifying the rating for each color of pencil at http://www.prismacolor.com/sitecollectiondocuments/prismacolor-watercolor-colored-pencils-lightfast-color-chart.pdf. I too count on Lisa Lachri for dependable info. Thanks for pointing this out about the Luminance pencils! I haven’t tried them myself, but they sound wonderful. What a great write up. Thank you for such detailed information Jane. You’re very welcome, Jody. I’m glad people are still getting something out of it!